Part of King County Library System’s Everyone’s Talking about It series. When everyone’s talking about it we can make a difference. Join in lively conversations about topics that matter. Meet Madi Carlson as she discusses Urban Cycling: How to Get to Work, Save Money and Use Your Bike for City Living. 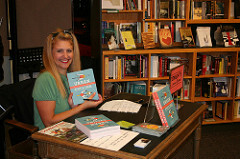 Her new book covers all the information a novice needs to get on a bicycle and start living a happier lifestyle!